FUN and PHYSICALLY DEMANDING job for an ACTIVE person aged 18 – 55 based in the PRESTON / BLACKPOOL / LANCASHIRE area! 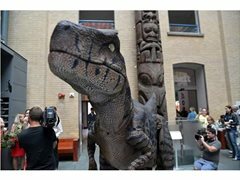 The successful applicants will be trained to handle 17ft long, 8ft tall Dinosaurs and Dragon! The Dinosaur Operator will work as part of a Team with a Dinosaur Ranger. The Dinosaur Ranger to assist operator with costume and put on show performance, alongside the dinosaur or dragon, for the public, remaining in character at all times. The audience must be left in no doubt that the dinosaur / dragon is your REAL pet! N.B. Hours varied; Full-Time during School Holidays & peak periods. Job involves driving to location, Holiday Parks, Schools, Events throughout the UK; communicating with clients and greeting members of the public in a polite and professional manner; setting up Dinosaur costume with the assistance of Ranger; performing 20 and 30 minute sets, as per contract for the public, interacting with the audience. As well as performing and being on the road, you will be required to take care of any emergency and necessary repairs as required e.g. painting, sewing, electrical wiring. A responsible attitude is an absolute must! Must have a 'can-do' sensible attitude and be 100% reliable. A good sense of humour will help! Must be slim build (to fit the costume) but strong as the job is physically demanding! Must be physically fit with a muscular frame and plenty of stamina! All applicants should be smart, communicative, interactive, able to deal professionally with Clients and general public. Full UK Driving License preferred. No experience required, full training given. Average earnings are between £80 - £150 per day depending on hours, work involved and travelling etc. All travel expenses paid, plus overnights where necessary. The first Introduction to Dinosaurs will be held on Saturday 30th March at 11am.